Home Gauge Ports/ Manifold Boost Taps MANIFOLD BOOST TAPS THE GFB VAG MK5/6 BOOST GAUGE TAP PROVIDES A NEAT & EASY MANIFOLD PRESSURE REFERENCE PORT FOR 2.0 TSI/FSI ENGINES. THE GFB VAG MK5/6 BOOST GAUGE TAP PROVIDES A NEAT & EASY MANIFOLD PRESSURE REFERENCE PORT FOR 2.0 TSI/FSI ENGINES. Easy To Install With No Tools And Is Completely Reversible. Single clip-on part, ready to go straight out of the packaging. Uses a ¼” hose barb that faces forward for better hose routing and to stop oil pooling in the bottom of the hose. Features two Viton O-rings which are impervious to oil, and a billet 6262-T6 aluminium body with a brass hose barb. Anodized black and laser engraved with the GFB logo, making it look right at home in the engine bay. Removal is simple and leaves no trace that it was ever installed. 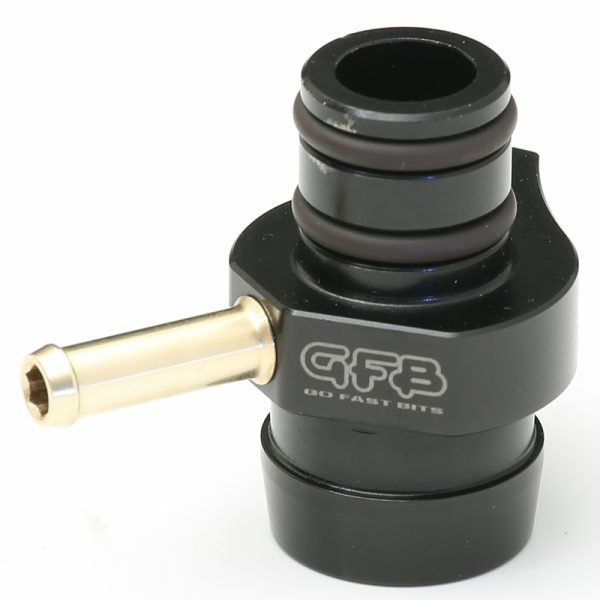 The Gfb Boost Gauge Taps Provide A Neat & Easy Manifold Pressure Reference Port.